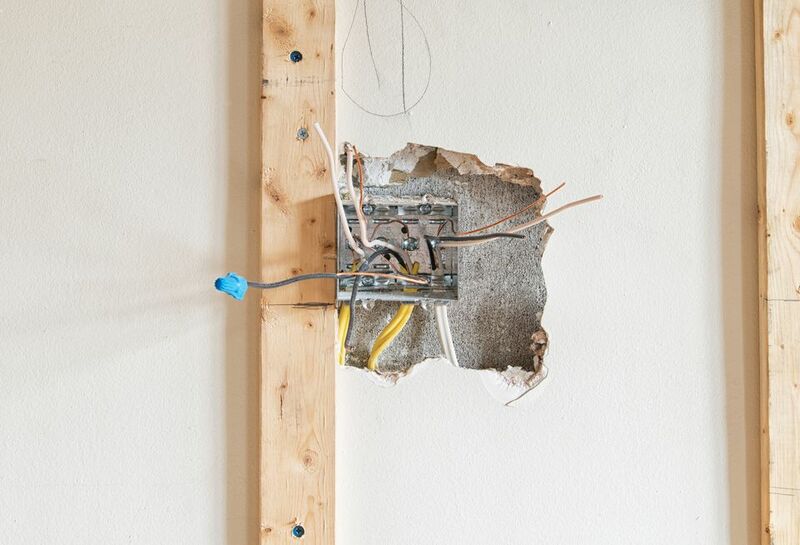 Cutting into closed walls to install ​electrical wiring is a thankless task. No one likes to cut into perfectly good wallboard. So, here are a few tips to make the job a little easier. Make a Door: When cutting out a square, leave the 4th side uncut--use this as a "hinge" to leave the drywall flap in place. That way, you don't loose the flap; you remember which was it fit into place, and you save yourself the trouble of taping up that side. Don't Cut Between Every Pair of Studs: Cut only between alternating studs cavities. I've found that I don't need to cut into every cavity. I can (usually) direct the wire blindly through the closed-up cavity into the hole in the stud. Making It Fit Back: If your drywall flap isn't fitting into place very well, it's probably because you've got a lot of drywall crumbs and dust along the edges. Just a little drywall debris is enough to prevent the flap from fitting nicely back into place. Perfection Not Necessary: Don't knock yourself out trying to cut a perfect shape for your opening. As long as it is within the width of a strip of drywall tape, you're fine.